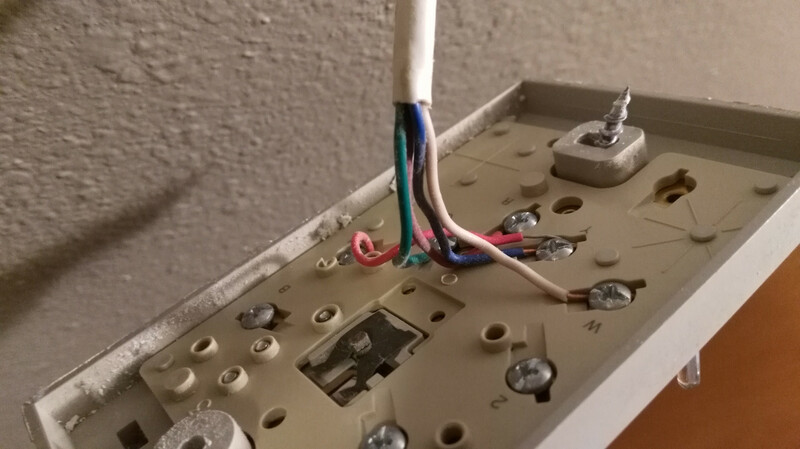 Apart from a thermostat, where else can a C-Wire go? As part of the home work before buying a smart thermostat (yes, because of the standard C-Wire issue! 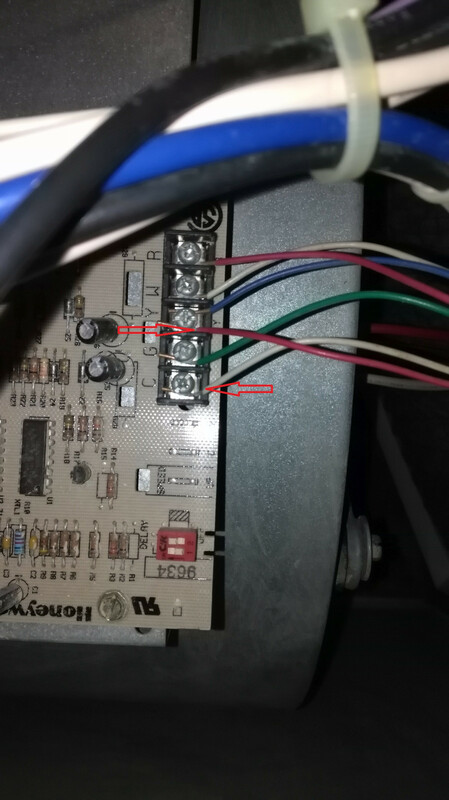 ), i noticed that my current old thermostat have only four wires (No C-Wire), but my furnace does have one and it is going somewhere else, which i am not able to figure out! Any idea where that C and Y could be going? Not sure if this is related, but I do have a Gas fireplace controlled by electric switches. Air conditioners need a C wire, too! That separate cable that is connected to your Y and C wires goes out to your air conditioner's outdoor unit. It connects to the coil of a contactor inside the outdoor unit that turns the compressor and condenser fan motors on when you want air conditioning and off when the air conditioning demand has been satisfied. Heat pumps require a fatter cable as they have more wires going to them, and some modern units substitute a control board for the simple contactor found in an older air conditioner as they have a multispeed or modulating compressor and/or multispeed condenser fan. Yes, the C-wire is used for other stuff, namely the normal loop circuit. 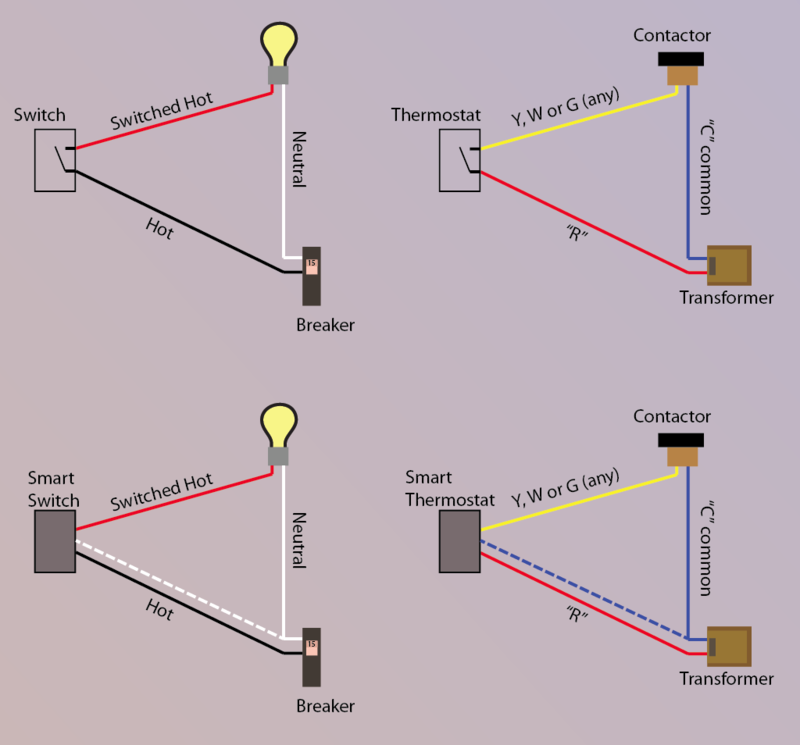 Here are functional (not routing) diagrams of traditional switch loops and thermostat circuits. It's the same basic wiring for any control circuit, be it calls for heat, fan, A/C, aux, heat pump changeover, any circuit. See the similarity? And below, what happens when you add a smart switch that needs neutral or C. Notice how it's the exact same problem with the exact same solution. thank you @JamesPoulose that answers my question as well. One wire (blue wire) to the thermostat is not connected to the old thermostat. I hooked it up to my new one and nothing. So then I switched back to the old (digital with batteries) since it does nothing. 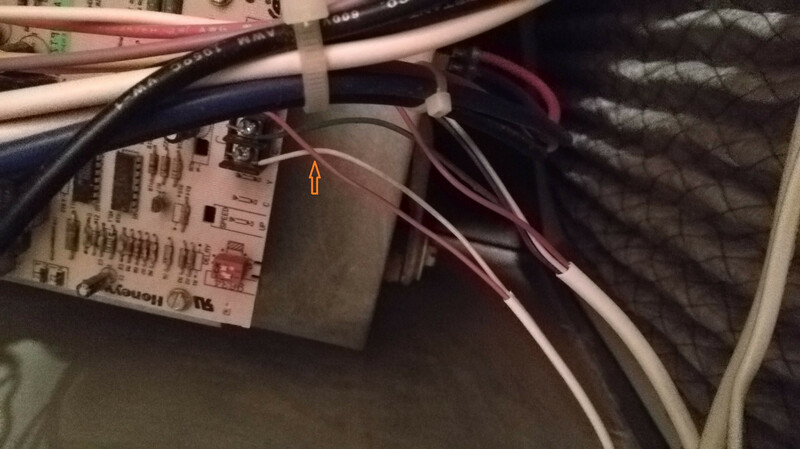 Go and find out, I checked the terminals on the furnace, blue wire is not connected to anything. However the c-terminal is connected to the white wire of the air conditioner. That's when I came to this post. @JamesPoulose response to yes it can be connected to c-wire on new thermostat and the air conditioner's white wire is very helpful. Luckily we have a tech coming out to diagnose our low heat problem because I'm not taking any risks with the furnace control box. However I am ok with wiring the new thermostat as it is easy to do.